While painful and annoying, they can be treatable: Hamstring injuries. The hamstrings are strong bands of tissue (tendons) on the back of the thighs that attach the large thigh muscle to the bone. According to the America Academy of Orthopaedic Surgeons, a hamstring strain refers to an injury in which the muscle or tendon is stretched or torn. Less severe strains are known as a “pulled hamstring.” A hamstring tear, also known as a rupture, refers to a more serious injury. Common in sports that require a great deal of running or quick reactive movements, many factors can lead to a hamstring injury. What to Do If You Have Hamstring Injury? An important muscle for activities such as running, jumping, and quick movement, if injured, you may feel a sharp pain in the back of your thigh leaving it hard to put weight on that leg. Once you notice discomfort, it’s essential to stop any activity immediately. Give your body and hamstring some time to rest. Begin ice and heat therapy to help reduce any swelling and help the blood circulate. Once your leg starts to feel better, begin gentle stretching to help open any tightness and strengthen the weak muscle. Proprioceptive Neuromuscular Facilitation (PNF) stretching helps improve flexibility, range of motion, and athletic performance. To begin, lie on your back with your legs extended on the ground and your feet flexed. Keep your left leg glued to the floor. Wrap a belt, towel or exercise band around your right foot. Lift your right leg as high as you can without too much force. Then, resist your leg with the belt, towel, or band as you push your leg into it for 10 to 20 seconds. Relax your hamstrings and draw your leg toward your chest for 10 to 20 seconds. Then repeat at least three times and the switch to the other leg. 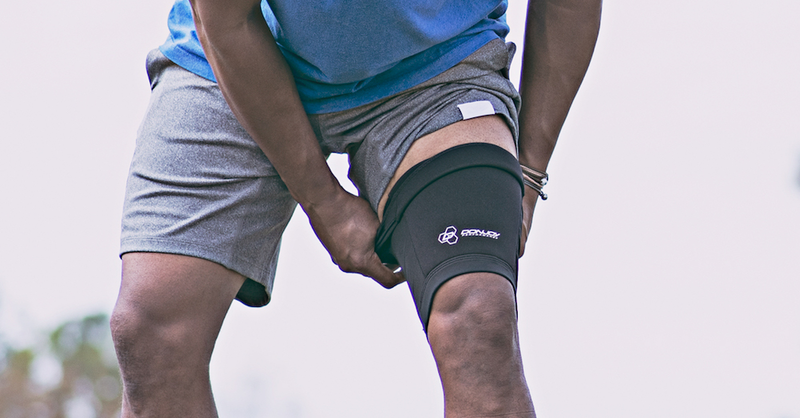 Wearing a compression sleeve can help ease hamstring soreness, aid to reduce inflammation, and help with circulation. As always, speak with a professional for specific diagnosis and exercises to get your hamstring back to health.